I first began posting my “Baja on the Fly” reports back in 1996, long before Bloodydecks was even a glimmer in the eyes of the site’s founders, Ali Huissany and Jason Hayashi. It wasn’t until September 2005 that I began posting my reports on at least two different BD forums. 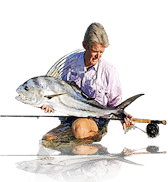 If you have an interest in Baja fishing, you probably have a general idea of the content of those reports. This new column, “Baja Bytes,” will deliver detailed Baja fishing reports on steroids. What’s biting, where, when and who’s catching will only mark the beginning. In addition to all of the fishing action, I’ll talk about obscure places, unusual encounters, interesting Baja characters, conservation, current events, tournament updates, new techniques and plenty of insider tips. I’ll probably toss in an occasional “good ol’ days story,” along with anything else that attracts my attention on my frequent drives up and down Mex 1. Yep, I still drive more than I fly. I just can’t see much at 30,000 feet. Cruising down the road in my self-contained Road Trek van is about as good as it gets. If you see a mint-green-and-white van with a BAJAFLY license plate, wave, honk or do something. In addition, Gilly observed that from February through March this year the mixed surface layer of the ocean has gotten steadily thinner — from about 300 feet in February to almost nothing by mid-March. Along with this change has come an abnormally steep fall in oxygen level down to levels too low to support pelagics at unusually shallow depths. Yellowfin tuna and billfish probably would have a really hard time under these conditions, because they would be compressed into the top 60 feet or so. If the bait in that surface zone is bountiful, you would think it might be good for the species. But if a fish can only breathe properly very close to the surface due to this habitat compression, this hypoxic stress might well affect its eagerness to feed regardless of the availability of prey. In 2009 and 2010 a similar trend developed during the spring, but it was much less severe. This year is definitely unusual. These are features normally associated with tropical eastern Pacific water much farther to the south. For the past several years, having the squid as a backup bait source when the sardina periodically disappear has been convenient. The first time that one of the captains suggested I use the squid was on a fly-fishing trip in East Cape. Since we would only be using the chunks for chumming yellowfin tuna, I was sure the pieces of squid would sink too fast to be effective. The buoyant squid pieces remained suspended in the water column much longer than the live sardina. Turned out to be one of the best chum baits we have ever used for the fly anglers. As usual, the Sea of Cortez is a puzzle that has many pieces. After several months of unusually dull billfish action, conditions suddenly improved. Striped marlin began to show from the tip all the way to Cerralvo. Not overly aggressive, but plentiful. So is everything back on track? Well, not exactly. Swordfish have begun to fin, and more importantly, bite, with several good-sized fish landed at Cabo — a good thing, but odd. Even odder is the sailfish that usually prefer warmer water have arrived in impressive numbers. The Sea of Cortez in March yielded some unusual puzzle pieces that demand more questions than provide answers. Got to love it! If fishing was predictable, it would lose its glitter quickly.